Karen here; today I'd like to share my super feminine friendship card. I hope you like pink & black as much as I do. Here's how I did it. 9. white card base 5x7"
1. 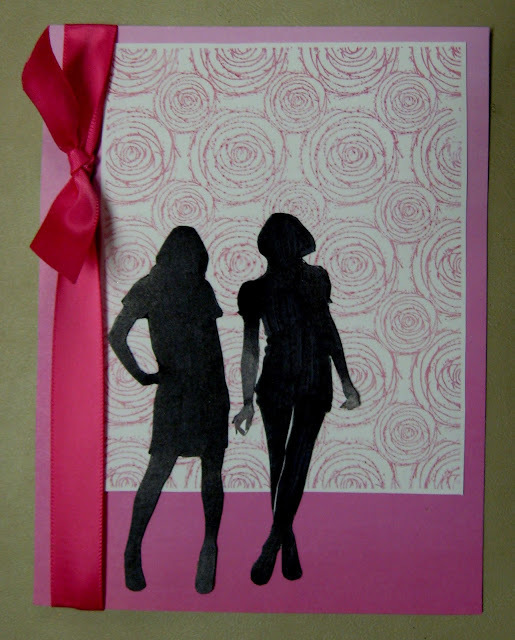 Stamp two different lady images onto white cardstock and color them in with a black marker to make a simple silhouette. Carefully, cut out the image. Use a craft knife for the small intricate areas. 2. Stamp the background roses onto white cardstock using a pink ink pad. Next, stamp a selection of various size roses to use as embellishments later. 3. 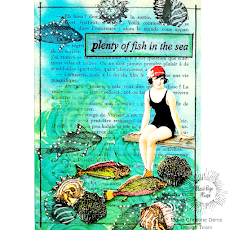 Attach a piece of pink cardstock to a 5x7" card base and adhere the stamped background rose panel to the upper portion of the card base. 4. Adhere the two silhouettes to the lower left corner of the card. 5. Tie a faux bow around an 8" length of pink satin ribbon. Fold the ends of the ribbon over the edge of the card and adhere them to the inside front panel. 6. Stamp the greeting onto transparency using permanent black ink. Next, use pink watercolor to paint some individual roses and cut them out when thoroughly dry. Attach them in clusters with dimensional foam tape. 7. Finally, embellish the roses with small glittered leaves. For more inspiring paper-craft projects from the Design Team, be sure to visit us at the Sin City Blog and follow us on Facebook.